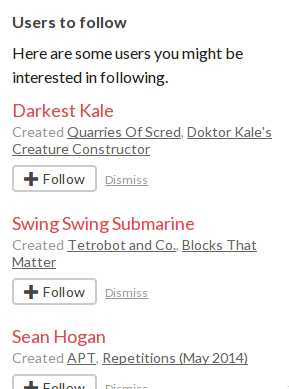 Now’s a better time than ever to start following your friends and favorite developers on itch.io. 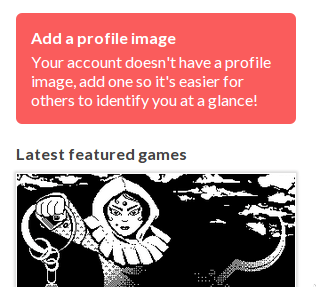 Anyone you follow will now contribute to your personalized timeline with the things they do on itch.io. This includes things like creating new games, updating existing games (like setting a new price or updating the game’s description), adding new game files, adding a demo, adding new screenshots, creating collections, adding games to collections, and rating games! If you’re new to itch.io then you’ll find featured games from the homepage there. If you’ve been around for a while then you might see Games to rate and Users to follow. 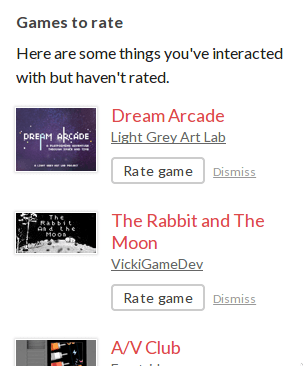 The Games to rate sections lists some games you’ve downloaded or played but haven’t rated yet. You can quickly rate the game, or if you prefer not to see that game, dismiss it. The Users to follow section suggests some users you might want to follow. If you’ve purchased a game or rated a game highly then the developer’s name might show up here. Additionally, to give you some context, some of the developer’s most popular games are listed below their name. Like the games section above, you can dismiss any users you don’t want to see. In the header of the page you can find new Following and Followers counts. Feel free to click either to be taken to a new page where you can manage your follows from a single location. Clicking on the date of the event will take you to a permanent link for the event that you can share. To the right of the date you’ll notice a few icons. Depending on if you created the event or not the icons might be different. Everyone has access to the heart. If you see an event you like click the heart to like it! If the event belongs to you then you have access to delete and edit buttons. Feel free to delete an event if you think it’s not relevant or useful to your followers. The edit button lets you change the text of the event. By default itch.io writes a little blurb summarizing what happened. If you want to be more specific or reveal some additional information then click the edit button and add your own text. You can even add text to events that might normally not have a description. itch.io starts you off with three different feed tabs. Your personalized one, the featured games feed, and then the global feed. 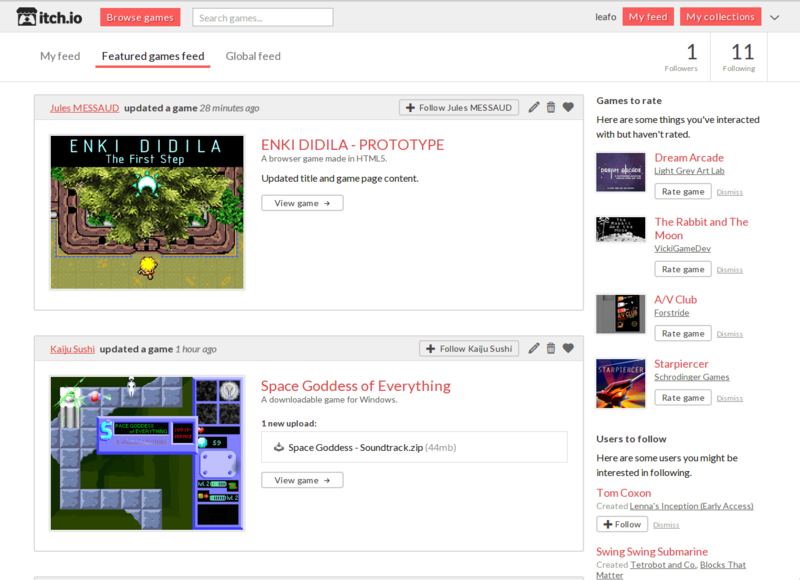 The featured games feed includes games that have been featured or tagged by itch.io at some point. The global feed is everything going on at itch.io. Enjoy the new games feed!